Formerly known as Zia International Airport, Hazrat Shahjalal International Airport is the biggest and busiest airport in Bangladesh. 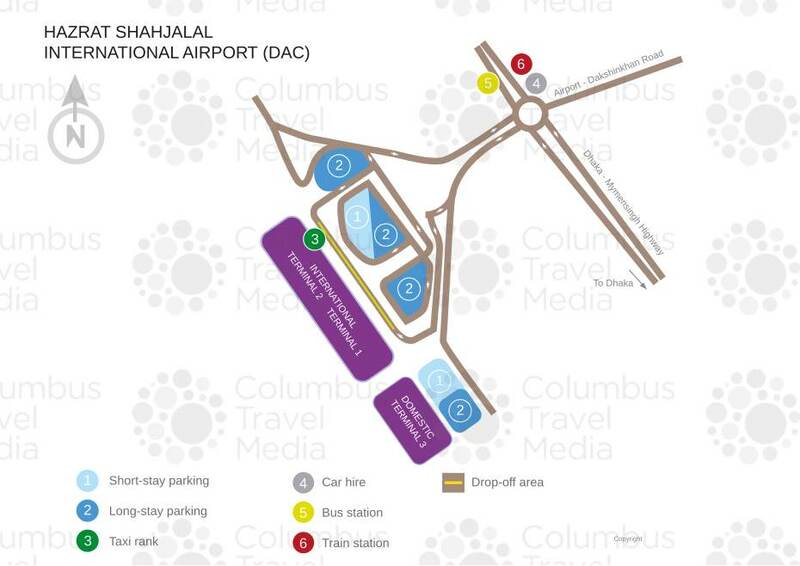 A useful resource for travellers, our Hazrat Shahjalal International Airport guide includes details of terminal facilities, public transport access and nearby hotel accommodation options. From central Dhaka, head north on the DHOS Bypass then take a right-hand turn onto Tongi Diversion Road (N3). Continue northwards, turning left at the roundabout signposted for the airport. The journey time is approximately 30 minutes. Hazrat Shahjalal International Airport is located around 8km (5 miles) north of Dhaka, approximately 30 minutes by car, depending on traffic conditions. Bus: There are several buses connect the airport to various places in Dhaka. The journey can take an hour (or longer). The bus stop is about five minutes’ walk from the airport. The bus routes are in Bengali so it can be challenging for tourists who don’t speak the language. Shuttle: Many of the larger hotels offer a shuttle service from the airport which is the easiest and most comfortable option. Taxi: There is a pre-paid taxi counter in the arrivals area, with fares to the city ranging from TK 1,000 to 1,500, depending on location and time of day. Cheaper taxis can be found outside the domestic terminal, but check if they are legitimate cabs and agree on the fare before setting off. Auto-rickshaws, locally known as CNGs, are abundant. Find them on the main road (Dhaka-Mymensingh Highway). They are fitted with meters but the drivers may not want to use it, so it is best to agree on the fare before getting on. From the airport, it costs roughly TK 100 to the city centre. Opposite the airport, on the other side of the Dhaka-Mymensingh Highway, is the Airport Railway Station. The distance between the two is about 1.7km (1 mile), takes about 20 minutes to walk. There are daily train services to and from downtown Dhaka. There are several bank desks and currency exchange booths near the luggage collection area in the arrivals hall. There are also a few on the first-floor in the departures area. There is one restaurant, located on the first floor, serving local as well as international cuisine; and several cafes can be found in the departures area before and after immigration. There are several shopping outlets at Hazrat Shahjalal International Airport, including duty-free shops selling brand products. There are prayer rooms on the second floor, as well as a baby-changing room. A couple of the airport/airline lounges offers basic meeting facilities. Meeting rooms are also available at the nearby hotels. Wi-Fi is available inside the (paid-for) executive lounges on the second floor. Services such as wheelchair hire and luggage porters are available in the first-floor departures area. There are car parking facilities for international and domestic travellers. The multi-storey international parking garage is at the northern end of the airport building. The rates are TK 50 for the first three hours. The domestic parking garage is small so finding a space may be tricky. A drop-off area is also available at the entrance to the arrivals lounge. There are four car rental companies authorised to operate at the airport, with desks at both terminals. Among them Europcar, Baba Autogas, Green Bangla Limousine and BM Transport.